A portable and easy mouth freshener to give you instant fresh breath. A portable and easy mouth freshener to give you instant fresh breath. A quick spray before a job interview, hot date or any important event will ensure you exude confidence. 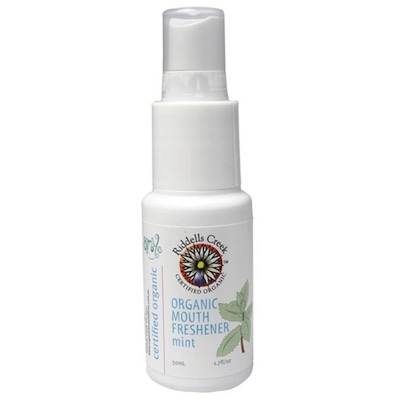 Riddells Creek Mint Mouth Freshener Spray is infused with an organic blend of sage, thyme and parsley to provide an immediate burst of freshness to your breath. Spray desired amount in mouth as required. Certified Organic Herbal Blend of Aloe Vera, Peppermint, Parsley, Rosemary, Sage & Thyme Extracts, Purified Aqua Water, Celtic Sea Salt, Organic Stevia, Grapefruit Seed Extract, Spearmint Essential Oil, Peppermint Essential Oil, Olive Leaf Extract, Organic Sugar Cane Ethanol.